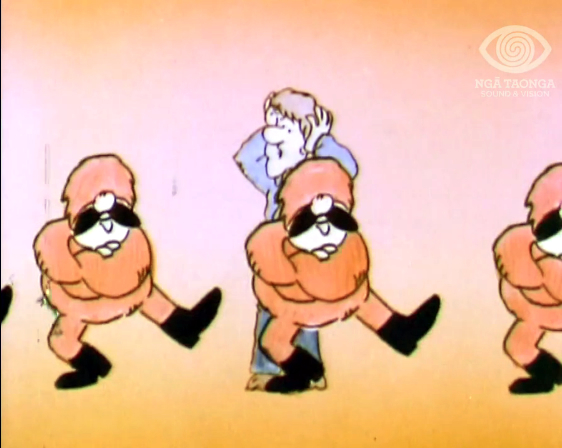 The National Party's 1975 'dancing Cossacks' advertisement is probably the most famous – or infamous – piece of election advertising in New Zealand's political history. In the first campaign held after the introduction of colour TV, National's advertising agency, Colenso, engaged the famous American cartoon studio Hanna-Barbera to produce a colourful, animated advert. National was trying to turn voters against the Labour government by suggesting that the latter's recently introduced compulsory superannuation scheme might lead to Soviet-style Communism (conveniently ignoring the fact that the Cossack peoples had traditionally been opponents of the Bolsheviks). It did the trick too, helping sweep Robert Muldoon's National Party into power in a landslide victory. Ref: C1555. Video from National Party 1975. Superannuation, 1975 TVC. Courtesy of the National Party. The Cossacks were white Russians and fought the Bolsheviks. Of course the agency wouldn't play The Internationale. Who was the narrator on this campaign?